I came across this D-Nuts bit last night. It’s not the first time I’ve seen it, but what the Hell? This time I thought I’d take a moment to bloggetize a comment or two on the matter. What’s interesting about this piece, you may ask? We could start with the most obvious game that’s being played here. On one level it is simply a red herring. A claim about the present-day Republican Party has been answered with a series of claims about the history of the GOP and the Democrats, thus substituting a question about what each HAS BEEN for an argument about what each IS today. Taken at face value, this red herring contains another problem, a seriously convenient omission of historical information, namely the shift in voting patterns over the 20th century culminating in the famous “southern strategy” of Richard Nixon. Simply put, an awful lot of southern conservatives switched parties over the years since the founding of the GOP and of the KKK. It’s tempting to say that a number of them did so precisely because they saw the modern GOP as a better vehicle for their own racist agenda. In any event, the shift has left both parties flip-flopped on civil rights and the proper balance of federal and state authority. There are some other factors besides race at work here to be sure, but a number of GOP leaders have made conscious appeals to racist sentiments over the years and the results have been quite striking. So, is it fair to say that the GOP is racist? I could see reasonable arguments against an affirmative answer. Those arguments do not rest on a conveniently incomplete account of history. Even still, I can’t help thinking the best (worst) part about this cartoon is just how well its content fits with its intended purpose. Here we have Charlie Brown whitesplaining the topic of racism to Franklin, the one black character in Peanuts. Franklin is clueless in comparison to Charlie’s wisdom. The cartoonist has him reacting with a stubborn inarticulate refusal to see Charlie’s point or even to engage the argument in any meaningful way. He just sticks to his position as if incapable of grasping the issues at hand. He is in effect simply playing the so called race card without any substantive reasons for doing so. 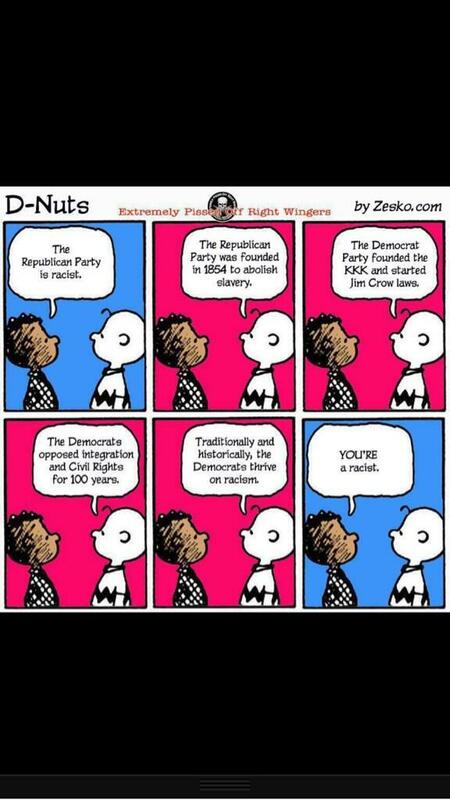 The GOP isn’t racist, so the cartoon would have us believe, but apparently it takes a white person to understand that. …a message which would probably come as no surprise to Franklin. How do you explain Tim Scott? I want to laugh and state how (can’t think of the proper word for it) trying to divide up all or nothing things under blanket labels never goes well. I say, people are unique. Yes yes yes. This is a narrative provided by the modern GOP–which conveniently forgets Nixon’s well-documented “southern strategy,” a strategy that the GOP continues to follow. And anyone who thinks that opposition to Obama is color-blind . . . Well, they just ain’t paying attention. If you could please point to the specific line in which I suggest ‘completely’ ignoring the history in question, I would appreciate it. Short of that, please refrain from posting empty talking points on my blog. The line that I quoted in my original comment suggests that we can’t argue for or against a political party using the said political party’s historical action as evidence. If I am misinterpreting what you meant by that line feel free to explain. As for “empty talking posts” I don’t really see what you mean. I made a point, provided a quote from the blog post to reenforce my point, and explained my reasoning. Would you have preferred I simply say “I disagree with this post for no particular reason”? It suggests no such thing Red Barron. The first panel is clearly presented in the present tense, whereas the subsequent panels are clearly about past events. I am objecting to that transition as it is a clear red herring. That said, I have also countered the historical evidence, not by declaring it categorically off-limits but referring to additional historical information about what has changed between the parties. this cartoon does not discuss the actions of both parties, past and present, as you suggest doing, it diverts people’s attention from current politics by offering a skewed account of history. Instead of addressing my actual criticism, you pretend that I am declaring history categorically irrelevant to present politics. If I thought your misrepresentation of my argument was an accident, I would be happy to discuss it with you. It is not. Dear Daniel, I’m an academic in the UK, and I’m using this Peanuts image (described verbally because my publisher will not include the image)as adapted variously (I’ve found at least four variants) in a book as a point of reference. Could I include your commentary as part of my contextualization. Where did you find this originally? Hi Philip, Absolutely. I’d be honored. I believe I first saw this on Twitter. I’ve seen it a few times, but I never tracked down an original source. I can understand the logical arguements, the shift in sentiments by Parties over time, etc. (especially in view of the apparent attitude and language in the current primary by the presumptive GOP candidate). But I connected with a bigger point here – at least what I coudl identify with – that we’re too quick with labels. Any disagreement, variation in opinion or facts, can result in a personal label being thrown at the disagreeer. And it seems worse today. People with labels aren’t really interested in the facts, respect for disagreement or diverse opinion. And some labels are charged with harmful intent. I think we just aren’t a respectful, diverse society anymore. Today, if you disagree, you’re a pig, racist, bigot, idiot, etc. Do we even know what those terms mean anymore and, if so, where they truly apply? Or maybe Franklin is wiser than we give him credit for, and Charlie is more naive than we give him credit for. Franklin aptly sums it up. Charlie is racist but he doesn’t know any better despite his dated and incomplete history lesson.